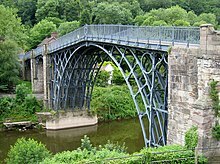 The Iron Bridge was the first arch bridge in the world to be made out of cast iron. The bridge crosses the River Severn at the Ironbridge Gorge, by the village of Ironbridge, in Shropshire, England. It is part of a UNESCO World Heritage Site. It is maintained by English Heritage who launched a crowdfunding campaign in 2017 to support a conservation project which began in 2018. As well as repairing rusted parts of the bridge, it was painted red to match a painting from 1777 showing how the Iron Bridge looked soon after it was finished. ↑ 1.0 1.1 UNESCO, "Ironbridge Gorge"; retrieved 2012-4-25. ↑ "English Heritage's first ever crowd funder raises final total of £47,545 to support vital conservation of the Iron Bridge | English Heritage". www.english-heritage.org.uk. Retrieved 2018-09-02. ↑ Growcott, Mat. "Back to the future as Iron Bridge set to return to its original red". www.shropshirestar.com. Retrieved 2018-09-02. This page was last changed on 2 September 2018, at 21:53.